Well, Minister, what will it be; death or vegies? My conversation with the chap from the minister’s office has a circular and satirical air, as he alternately denies the existence of documents I have seen (and in some cases possess) and insists he has already answered questions when what he has done is fob me off. Until finally, when I’m feeling distinctly Bryan Dawe-ish, the department’s John Clarke stand-in sighs forbearingly and says, “Hang on. I’ll see what we told the media.” And he reads me the press release, which was on the website. It sounds like some banana republic but actually it’s a little stoush that’s been bubbling away out back of Randwick for years now. A big stoush really, measured in area or complexity – titles, claims, faiths, ethnicities, that sort of thing – but low in profile. Which is strange given the symbolism. Death, or vegies. The story of the cemetery versus the market garden pits one heritage cause against another, one political correctness (multiculturalism) against another (locavorism), and one minister (lands) against another (planning). The story is straightforward. Two occupancies peaceably cohabit on Crown land for more than a century until one, the old Botany Cemetery (now Eastern Suburbs Memorial Park) feels impelled to colonise the other, the Chinese market garden to the south. Both uses have historical legitimacy. The cemetery’s first interment was 1893, while the vegie farms have been Chinese since the 1850s and existed, perhaps, since La Perouse in 1788. Each has precedent and plausibility: only one is expansionist. The theory is simple. The ministers (for lands, as owner, and planning, as regulator) would weigh the public interest – heritage, faith, food miles, natural justice – and decide accordingly. Except the two ministers are one man. That’s a complication, not to say direct conflict of interest. The government moved into death, so to speak, last year, promising transparency, sustainability and affordability. But the detailed commitments, from grave recycling to explicit product pricing, failed to materialise. Burial starts at $11,000, just for the dirt. A couple of those would pay the market gardens’ entire annual rent, just like that. Yet, says its annual report, the memorial park is “a hive of activity”, boasting “97 per cent customer satisfaction” with their “funereal services”, and even a “mystery shopping program”. Like Congratulations! Surprise cremation! Get yours now! And although it paints itself multicultural, claiming Aboriginal, Greek, Italian, Jewish and Muslim future customers, by far the bulk of its burials, and its propaganda, originate with the muscle-flexing, cremation-opposing Catholic and Orthodox faiths. “Souls outweigh salads,” declares an Orthodox priest Steven Scoutas, spokesman for the Archbishop. “It’s of great concern to the church that vegetables are regarded to be of greater heritage value than … human beings. Nothing,” he said, “is more sacred than the human person.” As though the farmers themselves were vegetables. Still not content, the cemetery employs a lobbyist, Gary Punch, the former federal minister. So who do you reckon will get to expand, and who be evicted? It should be otherwise. Ecologically, the markets should take over the cemetery, not vice versa. Why sterilise the land? If cemeteries were sacrosanct we’d have neither Town Hall nor Central Station. Why waste the nutrients? 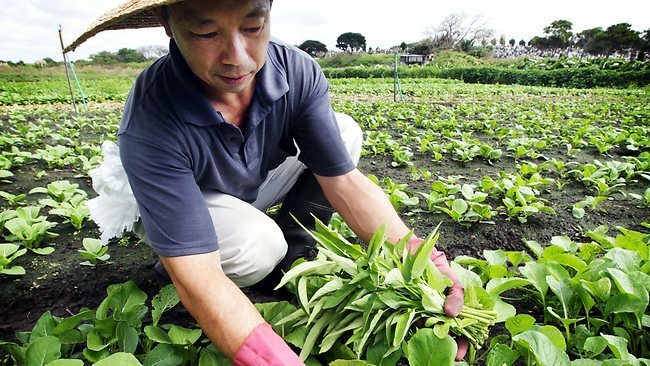 If people insist on being planted, why not rotate the uses, century and century about, letting the burials and the bok choy literally feed each other? Come to that, why not plant our dead with casuarina or river redgum seedling in their mouth, ready to grow? One reason, here, is the water table. In 2008 the department’s own assessment (one of the non-existent documents in my possession) found the market garden “not … suitable for … a cemetery”. Unsuited, in fact, for anything except nature conservation and agriculture. With housing gobbling our food-fields everywhere from Leppington to the Hawkesbury, we can hardly afford complacency on the food-miles front. And there’s this. Burial burps methane, wastes wood and locks up land. Cremation exhales greenhouse gases, energy and (eeuw!) particulates. So what about aquamation, which uses hot water and produces little more than bones and liquid fertiliser? Perhaps with a little spiritual application we could bring a new transcendence to the idea of dynamic lifter. Another wonderful article by Elizabeth combining mordant humour and serious purpose. She is our own eras Jonathan Swift! It would be a great pity to lose the market gardens. Every time I have been to the cemetery it has always fascinated me to look down to the market garden and realise how valuable a part of the greater Sydney story they are. A campaign is under way to stop this happening, be assured there is more than a scrap of paper being presented to the Minister in support of the Market Gardens. I recall the debate, over the loss of food producing land in the Penrith-Castlereagh-Cranebrook region of western Sydney, as the Penrith lakes scheme was being planned for by a visionary Penrith City Council, supported by ALP NSW State members of parliament, also holding ministerial office, in the then equally visionary Wran Government. Penrith City is a regional hub today and played a major role in the 2000 Olympic Games. and now these three remain, the market gardens, the cemetary and the royal Sydney golf course. but the greatest of these is the golf course. and it grows… grass, and could do with some natural fertiliser. By the 17th century the sanitary conditions around Saints Innocents were unbearable. As it was one of Paris’ most sought-after cemeteries and a large source of revenue for the parish and church, the clergy had continued burials there even when its grounds were filled to overflowing. ……A series of ineffective decrees limiting the use of the cemetery did little to remedy the situation, and it wasn’t until the late 18th century that it was decided to create three new large-scale suburban burial grounds on the outskirts of the city, and to condemn all existing parish cemeteries within city limits. ……Part of the reason nothing was done about Paris’ untenable burial practices was a lack of ideas for disposing of the dead exhumed from Paris’ intra-muros parish graveyards. The government had been searching for and consolidating long abandoned stone quarries in and around the capital since 1777, and it was the Police Lieutenant General overseeing the renovations, Alexandre Lenoir, who first had the idea to use empty underground tunnels on the outskirts of the capital to this end. His successor, Thiroux de Crosne, chose a place to the south of Paris’ “porte d’Enfer” city gate (the place Denfert-Rochereau today), and the exhumation and transfer of all Paris’ dead to the underground sepulture began in 1786.